In adversity, what are farmers doing to be more resilient? 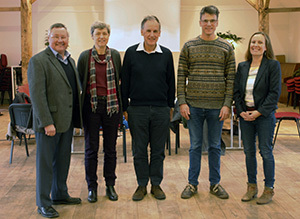 With continuing growth in the organic farming and food sector, the Organic Research Centre (ORC) – the UK’s leading independent research charity in this field - has announced the appointment of seven new trustees to its Council of Management, which is led by Chairman Mike Turnbull. Christine Watson, Donald Peck, Ned Westaway, Andrea Stewart. These forward-thinking new appointments for the ORC greatly extend the level of experience and knowledge of the Board. This comes at a critical time when the future direction of UK agriculture is a hot issue, on which the charity is ideally placed to contribute its expertise. The seven new trustees are: Tim Bennett, Professor Christine Watson, Adrian Blackshaw, Margaret Wagner, Andrea Stewart, Ned Westaway, and Donald Peck (please see brief biographies below). influence policy and public debates on the future of food and farming based on sound evidence. Tim Bennett - Tim farms an organic and grassland-based farm in Carmarthenshire, West Wales. He is Chairman of CIEL the agri-tech centre for Livestock innovations and also of the Farmers Club in London and is a former Chairman of the Food Standards Agency and former President of the NFU and of DairyCo (now AHDB Dairy). Christine Watson - Christine is Professor of Agricultural Systems at SRUC and a Guest Researcher at the Department of Crop Production Ecology at SLU (Swedish University of Agricultural Sciences). Christine leads a team of soil scientists working across the biology, physics and chemistry of soils. Her own research focuses on the management of micro and macro nutrients in organic and conventional agricultural systems. From 2003-2010 she served as a member of the Advisory Committee on Organic Standards (ACOS) and also chaired their R&D Subcommittee. Margaret Wagner - Margaret has worked in marketing for more than 20 years. Her focus is on brand building and driving new revenue streams for large, multi-nationals, including. Samsung, Citibank and Jaguar Land Rover. Originally from Connecticut, she worked in the marketing field for 15 years before creating her own start up in the retail sector. Margaret moved to London 7 years ago and is a strong advocate of organic and local farming and is passionate about taking both her marketing and business skills to this community to drive more sustainable and profitable commercial relationships. Andrea Stewart - Andrea has 18 years’ experience working in advocacy, communications and marketing. At Berry Bros. & Rudd, Andrea promoted pioneering biodynamic and organic European wine producers. In India, Andrea worked on sustainable development and advocacy programmes in rural communities and has worked with NGOs including CARE and Oxfam on an innovative collaboration to improve disaster coordination, risk reduction and accountability practices. Andrea is currently Head of Advocacy & Communications for a large network at the Centre for Tropical Medicine & Global Health at Oxford University. Andrea is a keen champion of organic principles and practice, and is delighted to support ORC’s communications and advocacy initiatives. Ned Westaway - Ned is a specialist barrister who practices at Francis Taylor Building in London. He is rated as a leading junior by Chambers & Partners in three areas: planning, environment and agricultural & rural affairs. He is on the Attorney General’s Panel of London counsel, is a trustee of the United Kingdom Environmental Law Association and is standing counsel for the Campaign for National Parks. Donald Peck - Donald is a retired emerging markets economist, who spent much of his career in South Asia and South America as a business adviser and investor. He worked for the World Bank Group in Washington DC, and then for CDC, the South Asia and Africa investment arm of DFID; later spending 12 years in India investing in businesses large and small. Since 1994 he has been a trustee and, since 2010, Chair of the UK Foundation Rachel & Pamela Schiele (FRPS), which runs a significant organic farming business in Argentina. Adrian Blackshaw – Adrian is Chairman of the Organic Trade Board (OTB) and a partner in a commercial organic apple and walnut business. Adrian has had a varied business background in a number of industry sectors, and gained considerable City experience with the Financial Times and as a Director of two quoted companies.